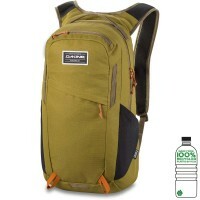 Dakine's ever-popular Canyon backpack now has a little brother, the Dakine Canyon 16L backpack . This completes the series with a Bike-Pack Specialist . 16 liters of volume is not too big but spacious enough to still be comfortable and both Bike equipment as well as catering . In addition to the main compartment, there are several small zipper compartments inside and outside , which provide a clear storage space for all sorts of trifles. Very handy is the convenient side pocket for a water bottle or gloves, which has been integrated into the breathable shoulder straps . The smaller Canyon Dakine backpack is a great mix of comfort and - thanks to trekking pole loop - versatility! 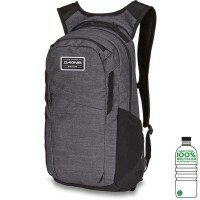 Customer evaluation for "Dakine Canyon 16L Backpack Seaford Pet"
Den Rucksack würde ich allen empfehlen, die mit dem Rad in der City unterwegs sind; für den Weg zur Arbeit / Schule / Uni / usw. Ist mit den ganzen Fächern wirklich super praktisch zum Transport - sitzt komfortabel - Und sieht top-edel aus!